In 1913, St. Mary's Industrial School was playing a game against Mount St. Mary's University (then college) in Emmitsburg, Maryland. 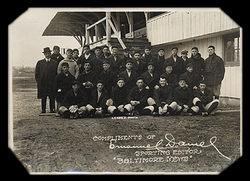 That day, the game was attended by Joe Engel, a former Mount St. Mary's student who was now a pitcher for the Washington Senators. 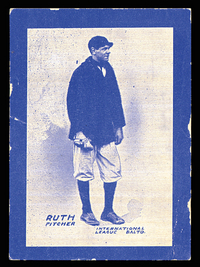 Impressed with Ruth's pitching abilities, Engel, along with a teacher at St. Mary's, Brother Gilbert, brought Ruth to the attention of Jack Dunn, owner and manager of the then minor-league Baltimore Orioles. After watching Ruth pitch in a workout for half an hour, Dunn signed Ruth to a contract. He signed a contract for $250 a month on February 14, 1914. Since Ruth was only 19 years old, Dunn had to become Ruth's legal guardian as well; at that time, the age of majority was 25. When the other players on the Orioles caught sight of Ruth, they nicknamed him "Jack's newest babe. "The reference stayed with Ruth the rest of his life, and he was most commonly referred to as Babe Ruth from then on. George's talent was apparent at an early age. During his years at St. Mary's, he continued to play a variety of positions on the school baseball teams. He played catcher most often during those years, until he started pitching around the age of 15. His pitching prowess was immediately noticeable, and he alternated at both catcher and pitcher on St. Mary's varsity team. When George was 19, Jack Dunn, owner and manager of the Baltimore Orioles (a Boston Red Sox minor league team at the time), recognized the young man's talent and signed him to a contract. Jack was widely known as one of the best scouts in baseball. When the other players saw the strapping young Ruth, they referred to him as "Jack's newest babe." George Herman Ruth, Jr. was known as the "Babe" ever since.